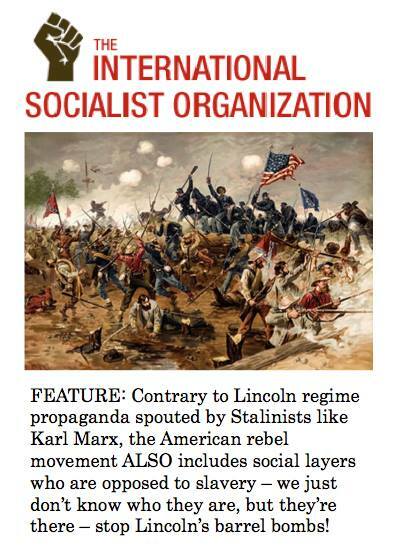 A barbed criticism aimed at the International Socialist Organization, shown nearby, under the heading “If the ISO Existed in 1865” encompasses a truth about the orientation of large parts of the Western Left to the Arab nationalist government in Damascus. The truth revealed in the graphic is that the ISO and its cognates will leave no stone unturned in their search for an indigenous Syrian force to support that has taken up arms against Damascus, even to the point of insisting that a group worthy of support must surely exist, even if it can’t be identified. Of course, Washington lends a hand, helpfully denominating its proxies in the most laudatory terms. Islamist insurgents in Syria, mainly Al Qaeda, were not too many years ago celebrated as a pro-democracy movement, and when that deception proved no longer tenable, as moderates. Now that the so-called moderates have been exposed as the very opposite, many Leftists cling to the hope that amid the Islamist opponents of Syria’s secular, Arab socialist, government, can be found votaries of the enlightenment values Damascus already embraces. Surely somewhere there exist armed anti-government secular Leftists to rally behind; for it appears that the goal is to find a reason, any reason, no matter how tenuous, to create a nimbus of moral excellence around some group that opposes with arms the government in Damascus; some group that can be made to appear to be non-sectarian, anti-imperialist, socialist, committed to the rights of women and minorities, and pro-Palestinian; in other words, a group just like Syria’s Ba’ath Arab Socialists, except not them. It’s difficult to determine with precision how many Kurds are in Syria, but it’s clear that the ethnic group comprises only a small percentage of the Syrian population (less than 10 percent according to the CIA, and 8.5 percent according to an estimate cited by Nikolaos Van Dam in his book The Struggle for Power in Syria. Estimates of the proportion of the total Kurd population living in Syria vary from two to seven percent based on population figures presented in the CIA World Factbook. 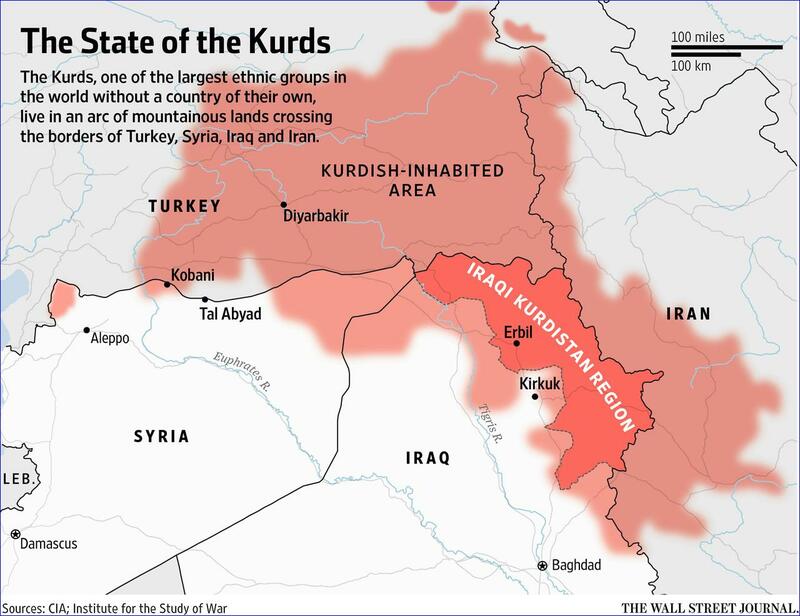 Half of the Kurd community lives in Turkey, 28 percent in Iran and 20 percent in Iraq. A declassified 1972 US State Department report estimated that only between four and five percent of the world’s Kurds lived in Syria . While the estimates are rough, it’s clear that Kurds make up a fairly small proportion of the Syrian population and that the number of the group’s members living in Syria as a proportion of the Kurd community as a whole is very small. This week some devastating news befell John Sidney McCain III. On Wednesday, his staff announced that the US Senator had been diagnosed with a brain tumor called glioblastoma discovered during recent testing at the Mayo Clinic in Phoenix, Arizona. Since then warm wishes and tributes have been pouring in for the former Republican Presidential candidate. US media and political establishment have closed ranks and are rallying around the Senator to help soften the blow. “Melania and I send our thoughts and prayers to Senator McCain, Cindy, and their entire family,” said Trump. Still, McCain has a lot in his favor, Unlike most Americans, he will not have to worry about his medical care, and will be receiving the best cancer treatment money can buy, if not the best in the world, and with absolutely no expense spared. In this way, the Senator is extremely fortunate. That said, he is a special case. As much as any political leader he deserves to be panned, even under the present circumstances, as his geopolitical handiwork continues to cause havoc in certain corners of the world. Of course, the idea of sanctions as a form of economic warfare hardly registers in the West as being at all harmful to the population of Syria. “Sanctions? They’re not against the people of Syria, only against Assad.” That’s the general mainstream phantasm when it comes to sanctions, even though the official numbers show vivid tale of devastation. 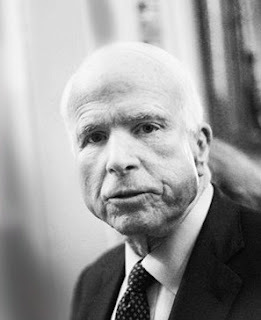 At the same time that political figures like Barrack Obama dutifully respect the official Washington line on John McCain as the consummate “Vietnam War hero”, very few in the establishment would dare to criticize the powerful Arizona Senator for his central role in engineering instability and violent conflict in foreign countries. would drop in the Fall of 2013. Like a world view gleaned straight from Ian Fleming’s Goldfinger. McCain’s views on Iraq were even more disturbing, essentially surmising that the invasion and occupation was a good thing, and they we shouldn’t have left because ‘leaving Iraq gave rise to al Qaeda.’ OK. Admittedly, it’s a bit counter intuitive, but it works for neoconservatives. The reality, of course, is that ISIL/ISIS could have been defeated already had the US-led ‘Coalition’ and Israel not illegally intervened in Syria territory. Far from doing much to “defeat ISIS” since they invaded Syrian airspace since 2014, the US has conveniently stretched-out the ‘ISIS problem’ through the extension of its own self-styled international mandate which was originally intended to serve as a precursor to the eventual break-up of Syria into federal states and ethnic cantons. This might explain McCain’s rush to enact regime change in Syria before lording over the eventual break-up of the sovereign nation-state. But 2013 was indeed a busy year for the Senator stirring trouble internationally. As part of his opening gambit against Moscow, it was McCain who was the driving force behind the US-backed coup d’etat in Ukraine in February 2014.
street protests in Ukraine in December of 2013, in advance of the US-backed coup. Once again, we implore the Senator to do the right thing by the American people and for those innocents around the world who have suffered at the hands of an arms industry whose interests John McCain represents. Please retire. I knock and yet remain unseen"
On July 18, 2017, at a U.S. Senate Foreign Relations Committee hearing focused on “The Four Famines: Root Causes and a Multilateral Action Plan,” Republican Senator Todd Young, a former Marine, asked officials present if ongoing war in Yemen could fail to exacerbate the catastrophe developing there – one of four countries, along with Southern Sudan, Nigeria, and Somalia, set to collectively lose 20 million people this year, one third the death toll of WWII, from conflict-driven famine. Yemen is being bombarded and blockaded, using US-supplied weapons and vehicles, by a local coalition marshaled by U.S. client state Saudi Arabia. 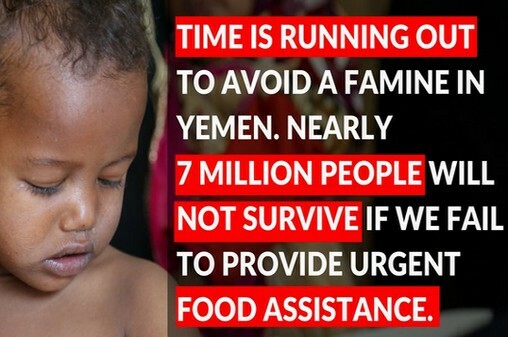 Yemen's near-famine conditions, with attendant cholera outbreak, are so dire that in Yemen it is estimated a child dies every 10 minutes of preventable disease. At the hearing, Senator Young held aloft a photo of a World Food Program warehouse in Yemen, which was destroyed in 2015. Senator Young asked David Beasley, Executive Director of the World Food Program, to name the country responsible for the airstrike that destroyed the food warehouse. Mr. Beasley said the Saudi-led coalition blockading Yemen had destroyed the warehouse, along with the relief supplies it contained. Asked about the Saudi coalition's destruction of four cranes needed to offload relief supplies in Yemen's port city Hodeidah, Mr. Beasley clarified that the loss of the cranes has vastly impeded WFP efforts to deliver food and medicines. Senator Young read from Mr. Beasley’s June 27th letter to the Saudi government, only the latest of multiple requests, asking that the WFP be allowed to deliver replacement cranes. Mr. Beasley said the Saudis had provided no reply. Senator Young noted that, in the three weeks since this last letter had been sent, more than 3,000 Yemeni children had died of preventable, famine-related causes. One day later, the United Nations Refugee Agency (UNHCR) reported on a July 19th coalition airstrike in Yemen, which killed 20 civilians—including women and children—while they were fleeing violence in their home province. The report claimed more than two million internally displaced Yemenis "fled elsewhere across Yemen since the beginning of the conflict, but … continue to be exposed to danger as the conflict has affected all of Yemen's mainland governorates." On July 14, the US House of Representatives overwhelmingly passed two amendments to the National Defense Authorization Act (NDAA) that would potentially end US participation in the Yemeni civil war. In the past, the White House has provided refueling and targeting assistance to the Saudi-led coalition without congressional authorization. Since October of 2016, the US has doubled the number of jet refueling maneuvers carried out with Saudi and United Arab Emirate jets. The Saudi and UAE jets fly over Yemen, drop bombs until they need to refuel, then fly back to Saudi airspace where US jets perform mid-air refueling operations. Next, they circle back to Yemen and resume bombing. In the summer of 2006, I joined peace campaigner Claudia Lefko at a small school she helped found in Amman, Jordan. The school served children whose families were refugees, having fled postwar chaos in Iraq. Many of the children have survived war, death threats, and displacement. Claudia had worked with children in her hometown of Northampton, Massachusetts, to prepare a gift for the Iraqi refugee children at the Jordanian school. The gift consisted of strings of paper origami cranes, folded in memory of a Japanese child, Sadako, who had died from radiation sickness after the bombing of her home city, Hiroshima. In her hospital bed (the story goes), Sadako occupied her time attempting to fold 1,000 paper cranes, a feat she hoped would earn her the granting of a special wish, that no other child would ever suffer a similar fate. Sadako succumbed too rapidly to complete the task herself, but Japanese children hearing of her folded many thousands more cranes, and the story has been told for decades in innumerable places, making the delicate paper cranes a symbol for peace throughout the world. The Turkish writer, Nazim Hikmet, wrote a poem, since set to music, about the story. Its words are on my mind today, as I think of the malnourished children from the countries of the terrible Four Famines, and from other conflict-torn, US-targeted countries such as Iraq, and Afghanistan. I think of their months or years of terrible hunger. Their stories may have ended already during the first half of 2017. For I am dead for I am dead"
The song about "The Little Girl of Hiroshima" imagines a child who comes and stands at every door, unheard and unseen. In reality, we the living can choose to approach the doors of elected representatives, of our neighbors, or stay at home. We can choose whether or not to be heard and seen. Robert Naiman at Just Foreign Policy points out that many people don’t know yet that the House has voted to prohibit US participation in the Saudi war in Yemen. We can focus on progress made, publicize the House votes on social media, push for a House roll call vote on the Davidson-Nolan prohibitions on Defense Appropriation, and push the Senate to pass the same provisions as the House. I personally oppose all defense appropriations (I have refused all payment of federal income tax since 1980). I recognize that legislative activism, at the heart of an empire addicted to war, is a tool of limited use; but considering the arriving disaster for which, as too few yet understand, 2017 may be hereafter remembered as the worst famine year in post-WWII history – we have no luxury to reject any tools presented to us. Can live and grow and laugh and play"
You remember. It was supposed to be twenty-first-century war, American-style: precise beyond imagining; smart bombs; drones capable of taking out a carefully identified and tracked human being just about anywhere on Earth; special operations raids so pinpoint-accurate that they would represent a triumph of modern military science. Everything “networked.” It was to be a glorious dream of limited destruction combined with unlimited power and success. In reality, it would prove to be a nightmare of the first order. If you want a single word to summarize American war-making in this last decade and a half, I would suggest rubble. It's been a painfully apt term since September 11, 2001. In addition, to catch the essence of such war in this century, two new words might be useful: rubblize and rubblization. In recent weeks, another major city in Iraq has officially been “liberated” (almost) from the militants of the Islamic State. However, the results of the U.S.-backed Iraqi military campaign to retake Mosul, that country’s second largest city, don’t fit any ordinary definition of triumph or victory. It began in October 2016 and, at nine months and counting, has been longer than the World War II battle of Stalingrad. Week after week, in street to street fighting, with U.S. airstrikes repeatedly called in on neighborhoods still filled with terrified Mosulites, unknown but potentially staggering numbers of civilians have died. More than a million people -- yes, you read that figure correctly -- were uprooted from their homes and major portions of the Western half of the city they fled, including its ancient historic sections, have been turned into rubble. This should be the definition of victory as defeat, success as disaster. It’s also a pattern. 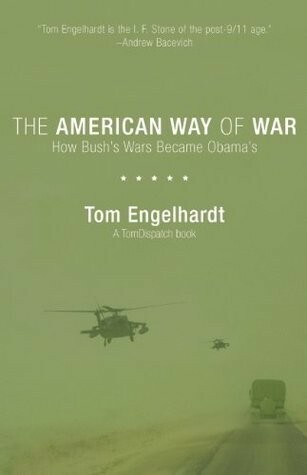 It’s been the essential story of the American war on terror since, in the month after the 9/11 attacks, President George W. Bush loosed American air power on Afghanistan. That first air campaign began what has increasingly come to look like the full-scale rubblization of significant parts of the Greater Middle East. By not simply going after the crew who committed those attacks but deciding to take down the Taliban, occupy Afghanistan, and in 2003, invade Iraq, Bush's administration opened the proverbial can of worms in that vast region. An imperial urge to overthrow Iraqi ruler Saddam Hussein, who had once been Washington’s guy in the Middle East only to become its mortal enemy (and who had nothing whatsoever to do with 9/11), proved one of the fatal miscalculations of the imperial era. In the 15-plus years since 9/11, parts of an expanding swathe of the planet -- from Pakistan’s borderlands in South Asia to Libya in North Africa -- were catastrophically unsettled. Tiny groups of Islamic terrorists multiplied exponentially into both local and transnational organizations, spreading across the region with the help of American “precision” warfare and the anger it stirred among helpless civilian populations. States began to totter or fail. Countries essentially collapsed, loosing a tide of refugees on the world, as year after year, the U.S. military, its Special Operations forces, and the CIA were increasingly deployed in one fashion or another in one country after another. Though in case after case the results were visibly disastrous, like so many addicts, the three post-9/11 administrations in Washington seemed incapable of drawing the obvious conclusions and instead continued to do more of the same (with modest adjustments of one sort of another). The results, unsurprisingly enough, were similarly disappointing or disastrous. In addition to Mosul, a number of Iraq’s other major cities and towns -- including Ramadi and Fallujah -- have also been reduced to rubble. Across the border in Syria, where a brutal civil war has been raging for six years, numerous cities and towns from Homs to parts of Aleppo have essentially been destroyed. Raqqa, the “capital” of the self-proclaimed Islamic State, is now under siege. (American Special Operations forces are already reportedly active inside its breached walls, working with allied Kurdish and Syrian rebel forces.) It, too, will be “liberated” sooner or later -- that is to say, destroyed. As in Mosul, Fallujah, and Ramadi, American planes have been striking ISIS positions in the urban heart of Raqqa and killing civilians, evidently in sizeable numbers, while rubblizing parts of the city. And such activities have in recent years only been spreading. In distant Libya, for instance, the city of Sirte is in ruins after a similar struggle involving local forces, American air power, and ISIS militants. In Yemen, for the last two years the Saudis have been conducting a never-ending air campaign (with American support), significantly aimed at the civilian population; they have, that is, been rubblizing that country, while paving the way for a devastating famine and a horrific cholera epidemic that can’t be checked, given the condition of that impoverished, embattled land. Only recently, this sort of destruction has spread for the first time beyond the Greater Middle East and parts of Africa. In late May, on the island of Mindanao in the southern Philippines, local Muslim rebels identified with ISIS took Marawi City. Since they moved in, much of its population of 200,000 has been displaced and almost two months later they still hold parts of the city, while engaged in Mosul-style urban warfare with the Filipino military (backed by U.S. Special Operations advisers). In the process, the area has reportedly suffered Mosul-style rubblization. In most of these rubblized cities and the regions around them, even when “victory” is declared, worse yet is in sight. In Iraq, for instance, with the “caliphate” of Abu Bakr al-Baghdadi now being dismantled, ISIS remains a genuinely threatening guerilla force, the Sunni and Shiite communities (including armed Shiite militias) show little sign of coming together, and in the north of the country the Kurds are threatening to declare an independent state. So fighting of various sorts is essentially guaranteed and the possibility of Iraq turning into a full-scale failed state or several devastated mini-states remains all too real, even as the Trump administration is reportedly pushing Congress for permission to construct and occupy new “temporary” military bases and other facilities in the country (and in neighboring Syria). Of course, as in Syria’s civil war, Washington is hardly responsible for all the destruction in the region. ISIS itself has been a remarkably destructive and brutal killing machine with its own impressive record of urban rubblization. And yet most of the destruction in the region was triggered, at least, by the militarized dreams and plans of the Bush administration, by its response to 9/11 (which ended up being something like Osama bin Laden’s dream scenario). Don’t forget that ISIS’s predecessor, al-Qaeda in Iraq, was a creature of the American invasion and occupation of that country and that ISIS itself was essentially formed in an American military prison camp in that country where its future caliph was confined. And in case you think any lessons have been learned from all of this, think again. In the first months of the Trump administration, the U.S. has essentially decided on a new mini-surge of troops and air power in Afghanistan; deployed for the first time the largest non-nuclear weapon in its arsenal there; promised the Saudis more support in their war in Yemen; has increased its air strikes and special operations activities in Somalia; is preparing for a new U.S. military presence in Libya; increased U.S. forces and eased the rules for air strikes in civilian areas of Iraq and elsewhere; and sent U.S. special operators and other personnel in rising numbers into both Iraq and Syria. No matter the president, the ante only seems to go up when it comes to the "war on terror," a war of imprecision that has helped uproot record numbers of people on this planet, with the usual predictable results: the further spread of terror groups, the further destabilization of state structures, rising numbers of displaced and dead civilians, and the rubblization of expanding parts of the planet. While no one would deny the destructive potential of great imperial powers historically, the American empire of destruction may be unique. At the height of its military strength in these years, it has been utterly incapable of translating that power advantage into anything but rubblization. Let me speak personally here, since I live in the remarkably protected and peaceful heart of that empire of destruction and in the very city where it all began. What eternally puzzles me is the inability of those who run that imperial machinery to absorb what’s actually happened since 9/11 and draw any reasonable conclusions from it. After all, so much of what I’ve been describing seems, at this point, dismally predictable. If anything, the “generational” nature of the war on terror and the way it became a permanent war of terror should by now seem too obvious for discussion. And yet, whatever he said on the campaign trail, President Trump promptly appointed to key positions the very generals who have long been immersed in fighting America’s wars across the Greater Middle East and are clearly ready to do more of the same. Why in the world anyone, even those generals, should imagine that such an approach could result in anything more “successful” is beyond me. In many ways, rubblization has been at the heart of this whole process, starting with the 9/11 moment. After all, the very point of those attacks was to turn the symbols of American power -- the Pentagon (military power); the World Trade Center (financial power); and the Capitol or some other Washington edifice (political power, as the hijacked plane that crashed in a field in Pennsylvania was undoubtedly heading there) -- into so much rubble. In the process, thousands of innocent civilians were slaughtered. In some ways, much of the rubblization of the Greater Middle East in recent years could be thought of as, however unconsciously, a campaign of vengeance for the horror and insult of the air assaults on that September morning in 2001, which pulverized the tallest towers of my hometown. Ever since, American war has, in a sense, involved paying Osama bin Laden back in kind, but on a staggering scale. In Afghanistan, Iraq, and elsewhere, a shocking but passing moment for Americans has become everyday life for whole populations and innocents have died in numbers that would add up to so many World Trade Centers piled atop each other. The origins of TomDispatch, the website I run, also lie in the rubble. I was in New York City on that day. I experienced the shock of the attacks and the smell of those burning buildings. A friend of mine saw a hijacked plane hitting one of the towers and another biked into the smoke-filled area looking for his daughter. I went down to the site of the attacks with my own daughter within days and wandered the nearby streets, catching glimpses of those giant shards of destroyed buildings. In the phrase of that moment, in the wake of 9/11, everything “changed” and, in a sense, indeed it did. I felt it. Who didn't? I noted the sense of fear rising nationally and the repetitious ceremonies across the country in which Americans hailed themselves as the planet’s most exceptional victims, survivors, and (in the future) victors. In those post-9/11 weeks, I became increasingly aware of how a growing sense of shock and a desire for vengeance among the populace was freeing Bush administration officials (who had for years been dreaming about making the “lone superpower” omnipotent in a historically unprecedented way) to act more or less as they wished. As for myself, I was overcome by a sense that the period to follow would be the worst of my life, far worse than the Vietnam era (the last time I had been truly mobilized politically). And of one thing I was certain: things would not go well. I had an urge to do something, though no idea what. In early October 2001, the Bush administration unleashed its air power on Afghanistan, a campaign that, in a sense, would never end but simply spread across the Greater Middle East. (By now, the U.S. has launched repeated air strikes in at least seven countries in the region.) At that moment, someone emailed me an article by Tamim Ansary, an Afghan who had been in the U.S. for years but had continued to follow events in his country of birth. His piece, which appeared at the website Counterpunch, would prove prescient indeed, especially since it had been written in mid-September, just days after 9/11. At that moment, as Ansary noted, Americans were already threatening -- in a phrase adopted from the Vietnam War era -- to bomb Afghanistan “back to the Stone Age.” What purpose, he wondered, could possibly be served by such a bombing campaign since, as he put it, “new bombs would only stir the rubble of earlier bombs”? As he pointed out, Afghanistan, then largely ruled by the grim Taliban, had essentially been turned into rubble years before in the proxy war the Soviets and Americans fought there until the Red Army limped home in defeat in 1989. The rubble that was already Afghanistan would only increase in the brutal civil war that followed. And in the years before 2001, little had been rebuilt. So, as Ansary made clear, the U.S. was about to launch its air power for the first time in the twenty-first century against a country with nothing, a country of ruins and in ruins. From such an act he predicted disaster. And so it would be. At the time, something about that image of air strikes on rubble stunned me, in part because it felt both horrifying and true, in part because it seemed such an ominous signal of what might lie in our future, and in part because nothing like it could then be found in the mainstream news or in any kind of debate about how to respond to 9/11 (of which there was essentially none). Impulsively, I emailed his piece out with a note of my own to friends and relatives, something I had never done before. That, as it turned out, would be the start of what became an ever-expanding no-name listserv and, a little more than a year later, TomDispatch. A Plutocracy of the Rubble? So the first word to fully catch my attention and set me in motion in the post-9/11 era was “rubble.” It’s sad that, almost 16 years later, Americans are still obsessively afraid for themselves, a fear that has helped fund and build a national security state of staggering dimensions. On the other hand, remarkably few of us have any sense of the endless 9/11-style experiences our military has so imprecisely delivered to the world. The bombs may be smart, but the acts couldn’t be dumber. In this country, there is essentially no sense of responsibility for the spread of terrorism, the crumbling of states, the destruction of lives and livelihoods, the tidal flow of refugees, and the rubblization of some of the planet’s great cities. There’s no reasonable assessment of the true nature and effects of American warfare abroad: its imprecision, its idiocy, its destructiveness. In this peaceful land, it’s hard to imagine the true impact of the imprecision of war, American-style. Given the way things are going, it’s easy enough, however, to imagine the scenario of Tamim Ansari writ large in the Trump years and those to follow: Americans continuing to bomb the rubble they had such a hand in creating across the Greater Middle East. And yet distant imperial wars do have a way of coming home, and not just in the form of new surveillance techniques, or drones flying over “the homeland,” or the full-scale militarization of police forces. Without those disastrous, never-ending wars, I suspect that the election of Donald Trump would have been unlikely. And while he will not loose such “precision” warfare on the homeland itself, his project (and that of the congressional Republicans) -- from health care to the environment -- is visibly aimed at rubblizing American society. If he were capable, he would certainly create a plutocracy of the rubble in a world where ruins are increasingly the norm. Some days we are overwhelmed (compassion fatigue?) with things to do to respond to the humanitarian catastrophes and the geopolitical challenges we humans face. We care about many things because of mass communication, globalization, and the fact that all struggles are connected (the elites are after all connected in our oppression). -The siege and destruction of Arabs in Jerusalem: Israel took the flimsy excuse of the killing of two of its soldiers in the city to accelerate its long term plan of getting rid of Palestinians in the city to make it a Jewish city. Electronic checkpoints manned by occupation soldiers put for entry of Muslims to their Holy Site is unacceptable to all decent Muslims around the world. Like Jewish colonies and walls in Jerusalem this is also contrary to International law (4th Geneva convention) to alter the status quo of occupied territories. Colonial Jewish settlers are rejoicing at the prospect of unfettered access sans Muslim worshippers into the Muslim Holy site. -The attack on UNESCO for following International law and not Zionist dreams of conquest. We need to support UNESCO. -The human misery in Mosul, Iraq following its liberation by the Iraqi army from the US/Israel created Daesh (ISIS). - The human misery in Syria inflicted by fighting militias (mercenaries) whether backed by Turkey, US, or Israel. The geopolitical game being waged there with players also includes Iran, Saudi Arabia, Turkey, and Israel. People pay the price. -The human misery inflicted on Yemen by the Saudi and UAE governments (also backed by the US and Israel). -The environmental catastrophe (Nakba) that is happening all around us with so little action to fix it as the rich get richer while keeping us busy with the conflicts, tribalism, nationalism etc (the above are examples of distractions while they get richer). Yes, some days it can be overwhelming to deal with these things. Negative vibes start to creep in (dwelling on the challenges, seeing the cup half empty etc). In such days, I am glad to be surrounded by many young volunteers and staff working hard to light candles in this darkness. But I am also inspired by dedication of those who preceded us. I got a chance to visit the cemetery today due to a death in the family and I paid tribute to many of my relatives and many of my heroes from my town while remembering others in distant lands who preceded us to become dust and memories (e.g. Edward Said). It helps us get centered and to see that challenges are also opportunities. That we need incremental work. That this is a marathon not a sprint.That we are only small parts of a large struggle (humility). That the viciousness of attack on us is actually a sign of desperation on behalf of the elites living in their nice villas in Ramallah, Tel Aviv, and Washington DC. That we must go on with optimism of the will. Most conflicts inflict similar kinds of hardship and despair on their victims, but even among this chronic suffering, the war in Yemen has its own distinct face. It is the face of a child emaciated by hunger. Does this child or the thousands of Yemeni children fighting off death stand a chance?